TROUSERS There are 7 products. Composition: Front: 100% Eko leather; Back: 55% cotton; 42% polyester; 3% spandex; Measurements : S waist 78cm, hips 94cm M waist 82cm, hips 98cm L waist 86cm, hips 102cm XL waist 90m, hips 106cmTrousers length 95cm. Composition: 100% Eko leather; Measurements : XXS waist 72cm, hips 78cmXS waist 76cm, hips 82cmS waist 80cm, hips 86cmM waist 84cm, hips 90cmL waist 88cm, hips 94cmTrousers length 105cm. Composition : 60% poliurethane;40% polyester; Measurements: XXS waist 72cm, hips 78cmXS waist 76cm, hips 82cmS waist 80cm, hips 86cmM waist 84cm, hips 90cmL waist 88cm, hips 94cmLength 105cm. 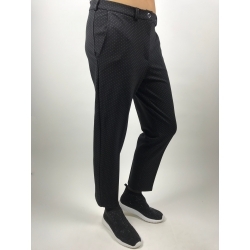 Leather imitation trousers with warmth inside.